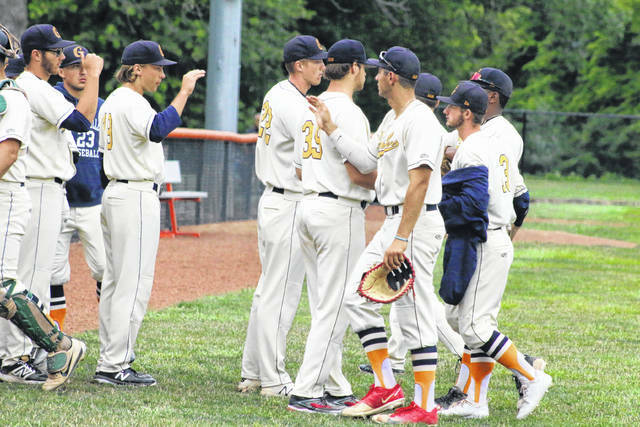 GALION — On Sunday, July 22, the Galion Graders returned home for a contest against the Licking County Settlers for their third game in two days. After splitting the doubleheader down in Newark on Saturday, the Graders were able to defend their home field and came away with the 6-4 victory over the visiting Settlers. With that victory, Galion moves to 18-17 on the season while Licking County drops to 8-27. The Settlers went quietly in the top of the first to send the hometown squad to the dish. Galion wasted no time finding their way to the scoreboard, beginning with an Eric Wentz lead-off single. After Licking County recorded an out, Jacob Reimold continued to scorch the ball, driving a single that put Wentz into scoring position at third base. With Juan De La Cruz at the dish, Settlers’ catcher Adam Mays committed an error to plate Wentz and allow Reimold to move to third after swiping second. He would not stay there long however as first baseman Vince Donato drove him in on a double, moving Juan to third. Austin Hathaway reached via a single, moving Donato to third. Hathaway proceeded to swipe second while Juan came across for Galion’s third run of the opening frame. Austin Harper would be walked and the bases now loaded for Luke Correia. Correia delivered Donato home with a single and kept the bases juiced for the Graders. Wentz would go down swinging in his second at-bat of the inning but the damage was done and Galion moved into the second inning up 4-0. Neither team would show much offensive prowess throughout the second or third innings but Licking County would finally get to Galion starting pitcher Jose De La Cruz in the fourth thanks to a three-run home run off of the bat of Brendan Alas to cut into the Graders lead; 4-3. Michael Rodriquez would walk to start the home-half of the fifth before Donato connected on his second hit of the contest, a single, which was Galion’s first hit since the opening inning. However, both Rodriquez and Donato would be left on the base path as the score remained the same heading into the sixth. Offensive would remain scarce for both teams in the sixth, despite Reimold drilling his seventh home run, a solo shot, to left field over the scoreboard to tack on a much needed insurance run and stretch the lead to 5-3. Licking County would score another run in the top of the seventh off of relief pitcher Nick Smith to inch closer at 5-4. The bottom of the seventh and the top of the eighth cruised by, sending Galion to the dish in the bottom of the eight still up by one run. Correia led-off the frame with a single, followed by a Todd Sekowski walk. With one out, Reimold notched his third hit of the game, another single, to load the bases. Juan De La Cruz brought in Correia on a sacrifice fly deep to right field before the Graders left two on. With the damage done, Galion headed into the top of the ninth up; 6-4. Down to their final three outs, the Settlers would have to face-off against Mac Spears on for the save. The first batter that Spears faced, Cael Baker, took the 1-2 offering long to left field. With Wentz following the ball and covering the ground, the knock would prove to be a long, dramatic flyout instead of another home run for Baker as Wentz leaped and snagged the ball a foot or so above the fence. With the momentum shift thwarted, Spears got the second out via a 5-3 groundout to put his fourth save of the season just one out away. Two walked batters later and Spears got Alas to strike out swinging to end the threat and the ballgame with the go-ahead batter at the plate. 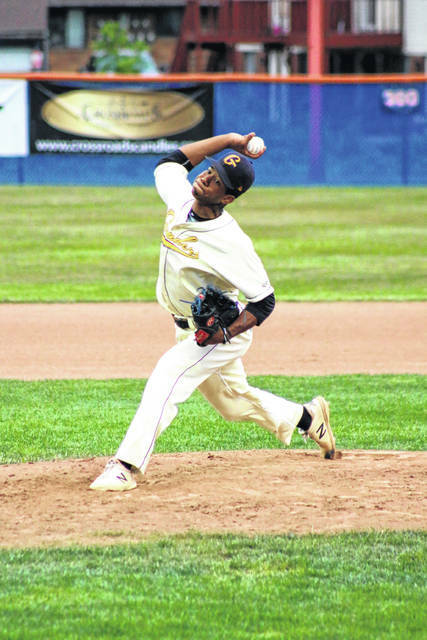 Jose went the first five frames for Galion en route to the victory, allowing just four hits and three earned runs while walking five and fanning three. Smith worked the following three innings, surrendering three hits and an earned run and giving up three walks while striking out two. Spears earned his fourth save by tossing an inning, walking two and fanning the final batter in Alas. For the contest, Licking County managed their four runs on seven hits, stranded 13 runners on base and committed just one error in field. Galion plated six on nine hits, stranded 11 runners of their own and committed a pair of miscues. Offensive statistics for the Graders on Sunday evening were: Team- 9/31, HR, 2B, 7-1B, 6R, 4RBI, 4SB, 11LOB, 8BB and 8K; Reimold- HR, 2-1B, 2R, RBI, SB; Donato- 1B, 2B, R, RBI; Correia- 2-1B, R, RBI; Wentz- 1B, R, SB; Hathaway- 1B, SB; Juan- R, RBI and Sekowski- SB (12th of the summer). Just three teams and six games remain for the Graders this summer. The first series will be at home against the Southern Ohio Copperheads on July 24th and 25th. Galion is 1-1 against the Copperheads this season despite being outscored head-to-head; 6-5. A very important trip to play the Hamilton Joes awaits the Graders on Thursday and Friday of this week as these two teams are playing for the third and final playoff spot in the Southern Division. Galion is 0-2 against Hamilton this season and have been outscored in those two contests; 27-11. The final two games of the season for Galion will be played against the Lake Erie Monarchs of the Northern Division. These two squads will meet on Saturday, July 28 (at Lake Erie) and on Sunday, July 29 at Heddleson Field in Galion. The Graders have dropped two against the Monarchs this season with Lake Erie holding the 5-3 run advantage. Special note regarding the playoff race: Hamilton’s final six games of the season will all be played against Southern Division teams (Xenia Scouts, Galion and Cincinnati Steam). The Graders are one victory shy of tying the mark for most wins in a season in franchise history (19). NEWARK — Following a loss in game one of a doubleheader with the Licking County Settlers, the Galion Graders responded nicely to take the second game of the double-dip; 9-6. Galion would use 10 hits to score their nine runs while Licking County plated their six runs on six hits. Both squads committed one error in field of play throughout the seven-inning contest. Unfortunately, due to an error with the Pointstreak system used by the Great Lakes Summer Collegiate League, stats from either team were unavailable at the time that the Inquirer was sent to print. NEWARK — The Galion Graders headed down to Newark and Don Edwards Stadium to meet up with Licking County Settlers for a doubleheader on Saturday, July 21. After being rained out back on Friday, June 22, the regularly schedule solo contest turned into a doubleheader and it would be the hosts taking game one; 2-1. Galion managed their lone run on five hits, committed no errors and stranded seven on the bases while Licking County won via walk-off, scoring two runs on eight hits while stranding eight on the bases. The Settlers had two miscues in the field of play during game one. Gaetan Sinisgalli got the nod as the starter and worked six-plus innings on the day. Sinisgalli exited the game in the bottom of the seventh after issuing a lead-off walk to Jacob Margroff. For the day, Sinisgalli was charged with both earned runs, allowed seven hits, walked four and struck out three. Smith came on in relief and recorded two outs in the seventh but allowed a single to Sam Wilson on a 1-1 count that plated Margroff to end the game. As a team, Galion went just 5/24 at the dish, recording one double and four singles while scoring one run and stealing a single base. The Graders walked four times and struck out six times against the Settlers’ pitching staff. Reimold notched a single, a double, the lone Galion run and a stolen base in the loss. Juan, Rodriquez and Hathaway had a single apiece on the day. Three of the Graders’ five hits came in the second and third innings but would not lead to any runs. In the fourth, Reimold led-off the inning with a single before putting himself in scoring position by stealing second. With nobody out, Matthew Detering drew a walk to put runners at first and second. A whole mess of errors and wild pitches would lead to Reimold crossing the plate for Galion’s only run in game one. In that fourth inning, the Graders would leave the bases loaded, squandering the chance to put themselves ahead of their hosts.